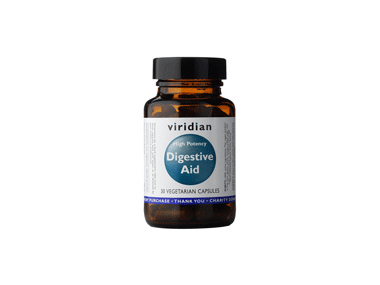 Buy Viridian High Potency Digestive Aid - 30 vegan capsules in the UK from our online shop or directly from our independent Scottish store. A vegan combination of enzymes, betaine hydrochloride, peppermint and ginger to help promote a healthy and well-balanced environment for digestion to take place with optimum efficiency. A vegan combination of enzymes, betaine hydrochloride, peppermint and ginger to help promote a healthy and well-balanced environment for digestion to take place with optimum efficiency. In a base of alfalfa, spirulina and bilberry. As a food supplement, take one to three capsules daily before food, or as directed by your healthcare practitioner. We sell real Viridian and other Digestive Aids directly from our shop in Scotland and online throughout the UK. Where can you buy real Digestive Aid 30's safely online? If you are wondering where you can buy Viridian High Potency Digestive Aid - 30 vegan capsules safely online in the UK, then shop with us. We are an actual health foods shop; with real people selling real foods and products. Our award-winning independent shop is located in Stirling, Scotland since 1976. You can buy our Digestive Aids in store or safely place an order with us online or over the phone. Digestive Aid 30's - Viridian High Potency Digestive Aid - 30 vegan capsules in Digestive Aids and Herbal Remedies, Tinctures & Supplements.